Tax considerations form an essential part of a corporate strategy and play a key role in determining the success of a business. 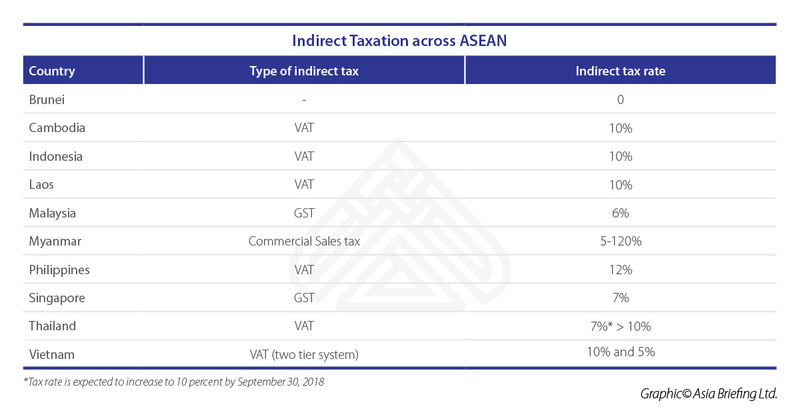 For those seeking to invest into more than just one ASEAN economy, or looking for a jurisdiction to base their business, an inter-country tax comparison can help make a suitable, cost-effective decision. In this chapter, we highlight some key difference in tax rates between individual member states. 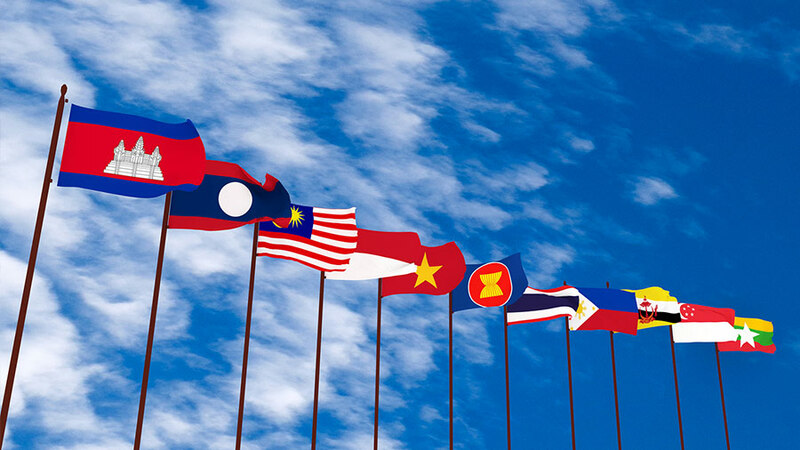 Lately, the indirect form of taxation – VAT and GST, have become more established in ASEAN. Five of the 10-member countries impose the VAT at a flat rate, ranging from 12 percent in the Philippines to seven percent in Thailand. Thailand is expected to raise the rate value to 10 percent by September 30, 2018. Vietnam, on the other hand, imposes a two-tier VAT rate – a standard rate of 10 percent and 5 percent for specific essential goods and services. Singapore and Malaysia collect a VAT-like tax – GST, whereas Myanmar imposes a commercial tax with rates ranging from 5 percent to 120 percent. Brunei does not employ any VAT or equivalent consumption tax. The average rate of CIT in ASEAN has shown a considerable decline in rates over the last 10 years. With the push towards greater economic integration, the governments of the regional bloc have substantially lowered CIT to augment long-term growth and differentiate themselves from the rapidly converging tariff structures found in the region. The lowering of CIT rates is often used as a tool by a government to improve the country’s attractiveness to foreign investors. Further, governments make extensive use of tax (as well as non-tax) incentives to attract FDI in forms such as tax holidays, accelerated depreciation or investment credits, which further lowers effective rate of tax for certain industries. These incentives are aimed at particular economic goals that vary depending on the economic structure of the economy. While some nations are interested in attracting FDI to generate positive spillovers in strategic sectors, some attract FDI for technology enhancement and knowledge transference. 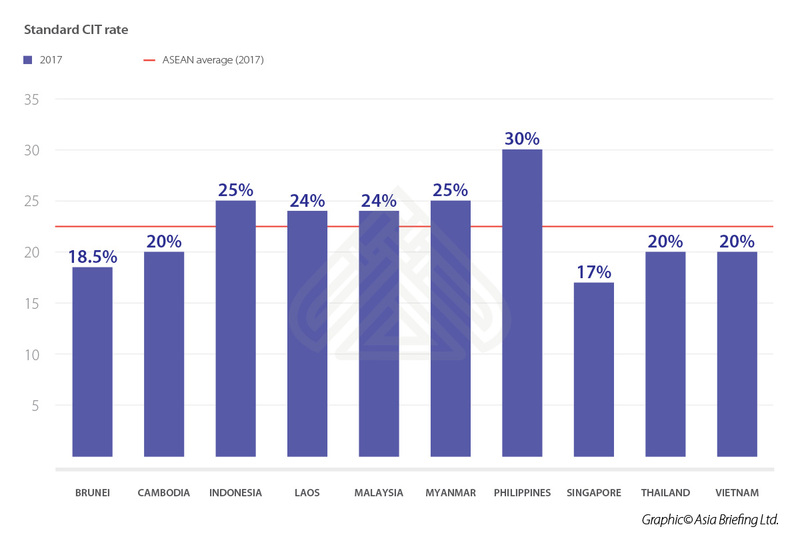 Currently, most of the ASEAN nations impose standard CIT rates that are all within a few percentage points of the 23 percent average, down from around 26 percent a decade before. Among the 10 member states, Singapore imposes the lowest CIT rate at 17 percent of the taxable income. In addition, it offers concessionary tax rates to new companies under its partial tax exemption scheme. Under the scheme, a company with a chargeable income of S$300,000 can benefit from an effective tax rate of only 8.36 percent, which is less than half of the actual CIT rate. Low CIT rate along with additional incentives considerably bring down the effective rate of tax, and as a result the overall cost of doing business. Cambodia, Thailand and Vietnam and Brunei also tax returns of domestic and foreign investors below the average ASEAN rate. The highest CIT is imposed by the Philippines at 30 percent of a company’s taxable income. PIT in almost all ASEAN countries relies on a progressive schedule with many brackets and a widely spread set of tax rates. Among the ASEAN countries, Malaysia has the most number of tax brackets, totaling 11; while Cambodia and Indonesia have the lowest, with five and four respectively. In general, all ASEAN countries have a progressive tax structure, with most of the ASEAN countries imposing a zero percent minimum PIT rate, exempting certain levels of income. Vietnam and Indonesia, however, are an exception, imposing a minimum rate of 5 percent on PIT. 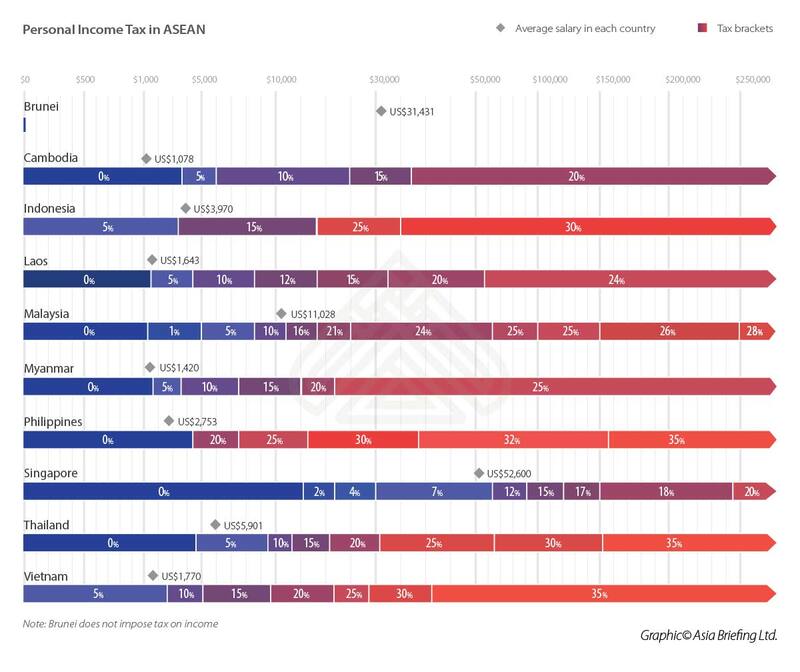 The Philippines, Thailand, and Vietnam have the highest maximum tax rate of 35 percent, whereas Singapore and Cambodia impose only 20 percent as their highest rate. In the figure below, we compare PIT tax brackets in individual member states. To help readers understand how these rates fit into the context of these countries’ wage structures, we have also included the GDP per capita of different ASEAN states. Besides the rate of taxation, another key issue for foreigners when determining PIT liabilities is the residency status. Tax laws of each ASEAN country define residency status of its taxpayers differently – and accord tax treatment accordingly. In Malaysia, for example, foreigners working in the country for more than 60 days but less than 182 days are considered ‘non-residents’ and are subject to a flat tax rate of 28 percent. Those working in the country for less than 60 days are exempt from paying taxes, whereas those working for more than 182 days are considered as ‘tax-resident’ and are subject to the standard rate of the PIT. Before calculating taxable income, foreign individuals in ASEAN must consult tax professionals from local jurisdictions to determine their residency status. Below, we compare withholding tax rates across 10 ASEAN countries. However, businesses must take note that the tax percentage varies within a tax legislation depending upon the nature of payment, resident status of the receiver, and whether the receiver is an individual, or a company. The rates also vary under double tax avoidance agreements (DTAs) signed between two countries. 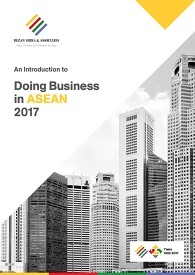 Closely assessing the varying tax rates can help businesses identify the relative costs of doing business with a given ASEAN state. For instance, countries such as the Philippines – charging a withholding rate of 15 percent on dividends – can be much more expensive in relation to countries such as Vietnam and Myanmar which employ a zero percent withholding rate on dividend. All rates outlined are indicative of the standard rate of withholdings applied to international remittances. Depending on the countries to which profits are remitted, companies may benefit from lowered withholdings rates if the origin and recipient country have signed a DTA. Thailand, for example, withholds a standard rate of 15 percent from all royalties sent abroad but discounts those sent to Singapore at a rate of five to 10 percent pursuant to the Thailand – Singapore DTA. 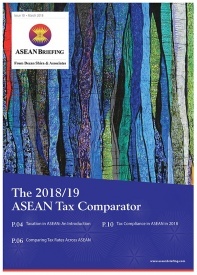 This article is an excerpt from the March 2018 issue of ASEAN Briefing magazine, titled “The 2018/19 ASEAN Tax Comparator“. In this issue, we discuss both the continuity and change in ASEAN’s tax landscape and what it means for foreign investors. We begin by highlighting the salient features of the taxation regimes of the individual member states of ASEAN. We examine the various forms of taxation within ASEAN while highlighting their regional variations. We then provide an inter-country comparison of tax rates, including in relation to PIT, CIT, VAT and GST, which is essential for making informed FDI decisions. Finally, we analyze the ease or burden of tax compliance in ASEAN in 2018 and beyond.